I just made version 0.4.2 of VPN Activator available for download. The new version is adding an Advanced configuration section where you will be able to specify the Search Domain for the VPN clients. This might eventually lead to the support of Wide Area Bonjour. This would give you access to all those shared services done over Bonjour on your local home network… like iTunes, Printers, etc. 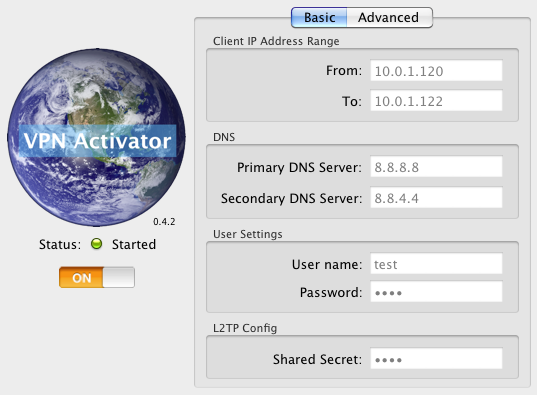 You can grab the latest copy from the VPN Activator page. Any planed support for PPTP? too difficult at this point. OK, I should be able to publish a new version later tonight that will configure your Mac to accept both an L2TP and PPTP VPN connection. It will be up to you to expose the one you want (or both if you wish) via your internet router. This will keep the interface clean without offering confusing L2TP & PPTP options to the users. If one does not like PPTP because it is not as secure as L2TP then simply don’t expose it across the internet router.